Penny Pritzker was sworn in Wednesday, June 26th, as the 38th United States Secretary of Commerce. Monday, July 1st, is Canada Day (French: Fête du Canada) the national day of Canada, a federal statutory holiday celebrating the anniversary of the July 1, 1867, enactment of the British North America Act, 1867, which united three colonies into a single country called Canada within the British Empire. Originally called Dominion Day (French: Le Jour de la Confédération), the holiday was renamed in 1982, the year the Canada Act was passed. Canada Day observances take place throughout Canada as well as among Canadians internationally. The American Textile History Museum ("ATHM") is proud to announce that Homefront & Battlefield: Quilts & Context in the Civil War has won a bronze medal in the 2013 Independent Publisher Book Awards for the U.S. History category. The book was published by ATHM in conjunction with its traveling exhibition of the same name. The "IPPY" Awards are conducted each year to honor the year's best independently published books. For more information on the American Textile History Museum, see the website www.athm.org. In my latest column in the BeaverLake6 Report I alert those who supply material or make finished certain luggage and travel articles that a bill has been introduced in the US Congress to make those finished products eligible for duty-free treatment under the Generalized System of Preferences. Many of the US luggage and handbag manufacturers I've spoken to view this attempt as a direct threat to their industry. Click here to read the column. Crown Clothing Co., Vineland, N.J., has been awarded a maximum $7,603,156 firm-fixed-price contract. This contract is for men's poly/wool coats. Location of performance is New Jersey with a June 24, 2014 performance completion date. Using military service is Marine Corps. Type of appropriation is fiscal 2013 Defense Working Capital funds. The contracting activity is the Defense Logistics Agency Troop Support, Philadelphia, Pa., (SPM1C1-13-D-1059). American Apparel, Inc., Selma, Ala., has been awarded a maximum $14,975,289 modification (P00012) exercising the first option year period for Marine Corps combat utility uniform blouse. The contract (SPM1C1-12-D-1038) is a firm-fixed-price/indefinite-quantity contract. Locations of performance are Alabama and Mississippi with a June 27, 2014 performance completion date. Using military service is Marine Corps. Type of appropriation is fiscal 2013 through fiscal 2014 Defense Working Capital funds. The contracting activity is the Defense Logistics Agency Troop Support, Philadelphia, Pa.
Woolrich, Inc., Woolrich, Pa., has been awarded a maximum $15,869,760 modification (P00010) exercising the first option year period for Marine Corps combat utility uniform trousers. The contract (SPM1C1-12-D-1039) is a firm-fixed-price, indefinite-quantity contract. Locations of performance are Pennsylvania, Mississippi, Texas, Alabama, and North Carolina with a June 27, 2014 performance completion date. Using military service is Marine Corps. Type of appropriation is fiscal 2013 through fiscal 2014 Defense Working Capital funds. The contracting activity is the Defense Logistics Agency Troop Support, Philadelphia, Pa. The U.S. Consumer Product Safety Commission ("CPSC") announced Friday that Ross Stores Inc., of Pleasanton, Calif., has agreed to pay a $3.9 million civil penalty. The penalty agreement has been accepted provisionally by the Commission in a 3-0 vote. The settlement resolves CPSC staff's charges that from January 2009 to February 2012, Ross knowingly failed to report to CPSC immediately, as required by federal law, that it sold or held for sale, about 23,000 children's upper outerwear garments with drawstrings at the neck or waist. In February 1996, CPSC issued guidelines (which were incorporated into a consensus industry voluntary standard in 1997) to help prevent children from strangling or getting entangled on neck and waist drawstrings in upper garments, such as sweatshirts and jackets. In May 2006, the Commission posted a letter on its website which stated that staff considered children's upper outerwear with drawstrings at the hood or neck to be defective and present a substantial risk of injury to young children. In July 2011, based on the 1996 CPSC guidelines and the 1997 voluntary standard, CPSC issued a final rule which designates the hazards presented by drawstrings in children's upper outerwear as substantial product hazards. Ross's distribution of some children's garments occurred during the same period of time as CPSC's investigation and negotiation of a 2009 civil penalty. The $500,000 penalty that Ross paid in 2009 was to settle staff charges that it failed to report four series of children's upper outerwear drawstring garments distributed between 2006 and 2008. Ross's distribution of the other garments in this matter occurred either partially or entirely after the effective date of CPSC's Final Rule. There have been no reported injuries associated with the recalled garments. In addition to paying a monetary penalty, Ross has agreed to implement and maintain a compliance program designed to ensure compliance with the reporting requirements of Section 15(b) of the Consumer Product Safety Act and the Final Rule. Ross also agreed to enhance its existing compliance policies by ensuring that its ongoing program contains written standards and policies, a mechanism for confidential employee reporting of compliance-related questions or concerns, and appropriate communication of company compliance policies to all employees through training programs. Ross has designed and implemented a system of internal controls and procedures to ensure that the firm's reporting to the Commission is timely, truthful, complete, accurate, and in accordance with applicable law. The company will also take steps to ensure that prompt disclosure is made to management of any significant deficiencies or material weaknesses in the design or operation of such internal controls. 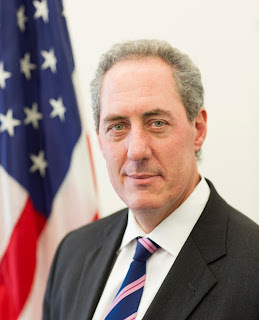 Michael Froman was sworn in as the 11th United States Trade Representative ("USTR") on June 21, 2013. As USTR, he is President Obama’s principal advisor, negotiator and spokesperson on international trade and investment issues. In the 1990s, Ambassador Froman spent seven years in the U.S. Government. He served as Chief of Staff and as Deputy Assistant Secretary for Eurasia and the Middle East at the U.S. Department of Treasury. He also worked at the White House, where he served as a Director for International Economic Affairs at the National Security Council and National Economic Council. An application has been submitted to the Foreign-Trade Zones (FTZ) Board (the Board) by the City of New Bedford, grantee of FTZ 28, requesting special-purpose subzone status for the facility of Talbots Import, LLC (Talbots), located in Lakeville, Massachusetts. The application was submitted pursuant to the provisions of the Foreign-Trade Zones Act, as amended (19 U.S.C. 81a-81u), and the regulations of the FTZ Board (15 CFR part 400). It was formally docketed on June 13, 2013. The proposed subzone (116 acres) is located at 175-190 Kenneth W. Welch Drive, Lakeville, Massachusetts. No authorization for production activity has been requested at this time. In accordance with the FTZ Board's regulations, Kathleen Boyce of the FTZ Staff is designated examiner to review the application and make recommendations to the FTZ Board. Public comment is invited from interested parties. Submissions shall be addressed to the FTZ Board's Executive Secretary at the address below. The closing period for their receipt is July 30, 2013. Rebuttal comments in response to material submitted during the foregoing period may be submitted during the subsequent 15-day period to August 14, 2013. "Two major, domestic athletic footwear brands -- New Balance and Wolverine World Wide -- are already prepared to produce 100% Berry compliant athletic shoes for the U.S. military. And at least one of those companies can do so at a lower price than the value of the cash allowances DOD gives soldiers now." SEC. 833. COMPLIANCE WITH DOMESTIC SOURCE REQUIREMENTS FOR FOOTWEAR FURNISHED TO ENLISTED MEMBERS OF THE ARMED FORCES UPON THEIR INITIAL ENTRY INTO THE ARMED FORCES. ``(d)(1) In the case of athletic footwear needed by members of the Army, Navy, Air Force, or Marine Corps upon their initial entry into the armed forces, the Secretary of Defense shall furnish such footwear directly to the members instead of providing a cash allowance to the members for the purchase of such footwear. ``(B) cannot be met with athletic footwear that complies with the requirements of this subsection.''. (b) Certification.--The amendment made by subsection (a) shall not take effect until the Secretary of Defense certifies that there are at least two sources that can provide athletic footwear to the Department of Defense that is 100 percent compliant with section 2533a of title 10, United States Code. The Committee for the Implementation of Textile Agreements ("CITA") has determined that certain textile and apparel goods from Benin shall be treated as "folklore articles" and "ethnic printed fabrics" and qualify for preferential treatment under the African Growth and Opportunity Act ("AGOA"). Imports of eligible products from Benin with an appropriate visa will qualify for duty-free treatment. CITA consulted with Benin authorities on November 7, 2012, January 3, 2013, April 11, 2013, and May 29, 2013 and has determined that folklore articles described in Annex A and ethnic printed fabrics described in Annex B, if produced in and exported from Benin, are eligible for preferential tariff treatment under section 112(a) of the AGOA, as amended. After further consultations with Benin authorities, CITA may determine that additional textile and apparel goods shall be treated as handloomed, handmade, folklore articles or ethnic printed fabrics. In the letter published below, CITA directs the Commissioner of U.S. Customs and Border Protection to allow duty-free entry of such products under U.S. Harmonized Tariff Schedule subheading 9819.11.27 if accompanied by an appropriate AGOA visa in grouping "9". (a) Bomba: Made of cotton and/or synthetic fibers. Hand-woven on manually operated looms then hand or machine stitched. There are also fringes on the end of the sleeves and the bottom of the shirt. The shirt extends beyond the waist, has a pocket, an open neck that stays closed, and the sleeves extend a little past the elbow; the embroidery is around the neck, down the neck opening to the chest, and on top of the pocket. The pants are baggy and have no embroidery. The pattern of the ensemble is houndstooth and the colors are variable, white, and black. (b) Barmassou (Daunchiki): Made of cotton and/or synthetic fibers. Bands are hand-woven in manually operated looms then machine stitched together to form a wider substrate. This is a three piece garment for men--hat, loose fitting outer garment that extends from the thorax to the knees, and baggy pants. Patterns can vary but are usually plain weave. Colors are usually white and sometimes black and white. (c) Boubou (Batik Peulh or Aizo): Made of cotton textile amassed, hand or machine assembled and hand dyed with repetitive patterns. This is a one piece dress for women--it is loose fitting with sleeves going to or a little past the elbow and the bottom of the garment going slightly past the knees. The edges of the sleeves and the bottom usually have fringes. Patterns and colors vary. (d) Daunchiki: Made of cotton and/or synthetic fibers. Bands are hand-woven in manually operated looms then machine stitched together to form a wider substrate. This is a three piece garment for men -- hat, loose fitting outer garment that extends from the thorax to the knees, and baggy pants with a cord that acts as a belt. Patterns are stripes of "fakle issile". Colors are usually white and sometimes black and white. (f) Peulh: Made of cotton from manually operated loom. This is a one piece dress/robe for women -- it is loose fitting with sleeves ending at the shoulder and the bottom of the dress/robe going to the mid-shin level. This dress also has a slight v-neck. The v-neck can be closed at the top with a loop and bottom. Colors and patterns vary. (g) Tako: Made of cotton bands hand-woven in manually operated looms then hand and/or machined stitched together to form a wider substrate. This is a three piece garment for men--hat, loose fitting outer garment which extends from the thorax to the feet, and baggy pants. Patterns are a mix of guinea fowl and bakoko. Comes in various colors, usually with vertical strips. (h) Tako (Grand Baubou): Made of cotton bands hand-woven in manually operated looms then hand and/or machined stitched together to form a wider substrate. This is a three piece garment for men -- hat, loose fitting outer garment which extends from the thorax to the feet, and baggy pants. The pattern varies and is usually plain weave. The colors are typically white, black and white. (i) Tchanka (Cavaliers Pants): Made of cotton fabric hand-woven operated on looms by hand and machine stitched. The colors vary and the pattern is houndstooth then gbangbana. It is a loose fitting pants for men, consisting of baggy from the waist to approximately the knees and then tighter after the knees to the ankles. (j) Wanwolovo: Made of mix of cotton and synthetic fibers. It is hand-woven from a manually operated loom to form a chain of patterns. This is a three piece garment for women--this consists of a wrap that goes around the body above the breast area and under the arms going down to below the knees; another wrap hangs over one shoulder; the last wrap is wrapped around the head. It has a chain of patterns. These wraps can have fringes on the ends. Colors are blue, red, white but colors can vary. (A) Selvedge on both edges. (B) Width of less than 50 inches. (C) Classifiable under subheading 5208.52.30 \1\ or 5208.52.40 \2\ of the Harmonized Tariff Schedule of the United States. (D) Contains designs, symbols, and other characteristics of African prints normally produced for and sold in Africa by the piece. (E) Made from fabric woven in the U.S. using U.S. yarn or woven in one or more eligible sub-Saharan beneficiary countries using U.S. or African yarn. (F) Printed, including waxed, in one or more eligible sub-Saharan beneficiary countries. \1\ printed plain weave fabrics of cotton, 85% or more cotton by weight, weighing more than 100g/m2 but not more than 200 g/m2, of yarn number 42 or lower. \2\ printed plain weave fabrics of cotton, 85% or more cotton by weight, weighing more than 100g/m2 but not more than 200g/m2, of yarn numbers 43-68. Yesterday President Obama, together with European Commission President Barroso and European Council President Van Rompuy, announced that the United States and the European Union (EU) will be launching negotiations on a Transatlantic Trade and Investment Partnership (T-TIP) agreement. The first round of T-TIP negotiations will take place the week of July 8 in Washington, D.C., under the leadership of the Office of the U.S. Trade Representative. Switlik Parachute Company Inc., Trenton, N.J., has been awarded a maximum $6,500,000 modification on a one-year base contract (SPE8EG-13-D-0021) with four one-year option periods for life preserver vests. The contract is a firm-fixed-price contract. Location of performance is New Jersey, with a June 12, 2018 performance completion date. Using military services are Army, Navy, Air Force, and Marine Corps. Type of appropriation is fiscal 2010 through fiscal 2014 Defense Working Capital funds. The contracting activity is the Defense Logistics Agency Troop Support, Philadelphia, Pa. The Federal Trade Commission is seeking public comment on proposed changes to the guaranty provisions of the Fur Rules, under the Fur Products Labeling Act. These changes would align the Fur Rules with proposed changes to the guaranty provisions of the Rules under the Textile Fiber Products Identification Act. The Fur Rules require manufacturers and retailers to label fur products with certain information, such as the animal’s name and an imported fur’s country of origin. The Textile Rules require that certain textiles sold in the United States carry labels disclosing the generic names and percentages by weight of the fibers in the product, the manufacturer or marketer name, and the country where the product was processed or manufactured. The Fur and Textile Acts shield entities that obtain guaranties from product providers from liability – guaranties that designate particular products, and continuing guaranties that apply to all products transferred from a particular guarantor. The guaranty protections apply only to entities that receive a guaranty in good faith. In April 2013 the FTC proposed changes to the Textile Rules’ guaranty provision which are similar to these proposed Fur Rules changes. In September 2012, the FTC proposed changes addressing other issues in the Fur Rules. The FTC will seek comment on the proposed changes to the Fur Rules’ guaranty provisions before finalizing the changes proposed in September 2012, and then publish a single document announcing all Fur Rules changes at once in order to help businesses understand their compliance obligations. Instructions for filing comments on proposed changes to the Fur Rules will appear in the Federal Register soon. Comments must be received by July 23, 2013. All comments received will be posted on the FTC website. The Toray facility (233 employees) is located at 2030 Alabama 20, Decatur, Alabama. A separate application for subzone status at the Toray facility is planned and will be processed under Section 400.31 of the FTZ Board's regulations. The facility is used for the production of polyacrylonitrile (PAN)-based carbon fiber, and PAN fiber, the primary material input for the company's carbon fiber. The facility will produce carbon fiber from both its own domestically-produced PAN and from foreign-sourced PAN. Components and materials sourced from abroad (representing 70-75% of the value of the finished carbon fiber made from foreign-sourced PAN, and less than 1% of the value of carbon fiber made from domestically-produced PAN) include PAN fiber (duty rates, 7.5%--24,000 tow and 8%--12,000 tow), and sizing agents, spinning oils, solvents and spools/bobbins (duty rates range from 3.7-6.5%). The request indicates that the savings from FTZ procedures would help improve the plant's international competitiveness. In accordance with the FTZ Board's regulations, Diane Finver of the FTZ Staff is designated examiner to evaluate and analyze the facts and information presented in the application and case record and to report findings and recommendations to the Board. Public comment is invited from interested parties. Submissions shall be addressed to the FTZ Board's Executive Secretary at the address below. The closing period for their receipt is August 12, 2013. Rebuttal comments in response to material submitted during the foregoing period may be submitted during the subsequent 15-day period to August 27, 2013. The U.S. Department of Commerce, Office of Textiles and Apparel ("OTEXA"), is pleased to endorse and organize a USA pavilion in the upcoming Expo Produccion event in Mexico City, Mexico, February 5-7, 2014. Expo Produccion is the only trade show and conference serving the complete sewn product supply chain for the fashion, home and technical textile industries in Mexico and Central America. OTEXA invites you to participate and attend this event. For more information, please contact Kim-Bang Nguyen at kim-bang.nguyen@trade.gov for more information. U.S. District Court Judge for the Southern District of Florida Kathleen M. Williams issued a significant sentence in federal court for violations of U.S. consumer product safety laws. Hung Lam, President of LM Import-Export Inc., of Miami, Fla., was sentenced to 22 months incarceration in federal prison, three years of supervised release and a $10,000 fine for pleading guilty to conspiracy to traffic and smuggle in banned children's products that contained lead and small parts, in violation of federal laws enforced by the U.S. Consumer Product Safety Commission ("CPSC"). Mr. Lam was also convicted of one count of trafficking in counterfeit goods. From about April 2000 through May 2011, defendant Lam and his related corporations LM Import-Export Inc., Lam's Investment Corp., and LK Toys Corporation, conspired to sell and distribute in commerce banned children's products imported from China. These actions were in violation of the Consumer Product Safety Act and the Federal Hazardous Substances Act. These products allegedly presented the risk of choking, aspiration, and ingestion, and some contained lead above the federal limits. To learn more about this conviction and the related civil penalty and injunction imposed, see the Department of Justice press release http://www.justice.gov/usao/fls/PressReleases/130531-01.html. U.S. Customs and Border Protection ("CBP") announced yesterday the opening of the final three Centers of Excellence and Expertise ("CEE") - Agriculture & Prepared Products in Miami, Apparel, Footwear & Textiles in San Francisco, and Consumer Products & Mass Merchandising in Atlanta. These final CEEs, created through extensive collaboration between industry stakeholders and CBP, will bring the total number to ten. The CEEs virtually connect CBP personnel around the country by leveraging new technologies and develop comprehensive strategies to better facilitate trade and improve coordination with partner government agencies. The other seven Centers are Automotive & Aerospace in Detroit; Base Metals in Chicago; Electronics in Los Angeles; Industrial & Manufacturing Materials in Buffalo; Machinery in Laredo; Petroleum, Natural Gas & Minerals in Houston; and Pharmaceuticals, Health & Chemicals in New York. The Festa della Repubblica is celebrated on the second day of June, and it commemorates the institutional referendum of 1946 when the Italian population was called to decide what form of government (monarchy or republic) to give to the country after World War II and the fall of Fascism.